My preferred method of cleaning carpets is hot water extraction; commonly referred to as “Steam Cleaning”. I have invested over £15,000 in the most modern equipment available. 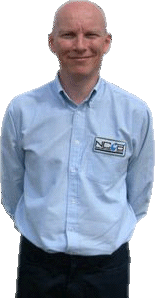 Other elements of the cleaning process are required to achieve the best possible results, these are recommended by the NCCA (National Carpet Cleaners Association), of which I am an accredited member. There can be a temptation to leave out one or more of these processes to save time. However, I rarely book more than one customer a day, which allows me enough time to clean your carpets thoroughly using this 9 stage process. Room Preparation. I will move larger furnishings such as sofas and chairs. For insurance reasons I ask all customers to move smaller, valuable items such as ornaments before I arrive. Vacuum. Then I vacuum your carpets using a powerful Sebo commercial vacuum cleaner. You will be amazed at what this is capable of picking up after you have vacuumed, it beats a Dyson any day. Carpet Treatment. Depending on the carpet type any spots or stains will be treated at this point or after extraction. The nature of the stain and fibre must first be determined before any attempt to remove is made. Pre-Spray. Next your carpet will be pre-sprayed which will help break up any dirt still present in your carpet. Agitation. The pre-spray will be agitated into the carpet with a specially designed machine with contra rotating brushes. The same principle as rubbing your hands together when you wash them to loosen the dirt. Hot water extraction. Now the really interesting bit! Hot water extraction or steam cleaning. For this I use a very powerful machine capable of temperatures of 110C. It applies a fine jet of steaming hot solution under high pressure directly into the carpet fibres, it is then immediately extracted using powerful vacuum pumps. This is performed almost simultaneously, therefore not allowing the base of the carpets to become sodden. Thus, considerably speeding up the drying time. Drying. A powerful air mover is then placed in the room. This can speed the drying time of carpet and upholstery up to 70%. Grooming. Where appropriate, the carpet will be groomed using a carpet rake. Replace Furniture. Finally furniture is replaced on either Styrofoam blocks or foil tabs. This prevents any residual moisture in the carpet from leeching furniture stain that might otherwise spoil your beautiful clean carpet. Carpet manufacturers recommend that carpets are cleaned once a year to help maintain their quality as well as prolong their life. Built up soils, grit and dust can act like sandpaper in your carpet fibres, shortening the lifespan of your carpets and making traffic lanes look faded and worn well before the time you would expect. Investing in professional carpet cleaning and maintenance means your carpets can last longer and you can save money in the long run. At Roffey Cleaning we know the idea of having your carpets cleaned can seem like a daunting task but when you book us, we can take away some of the worry for you. Our professional cleaning program sees us follow a step-by-step process to ensure we get the best results for you. Using the latest techniques, training and recommended products, we are able to determine the best method of cleaning your carpet at home. Many people in Southend-on-sea have already benefited from our great service, including families that wanted to freshen up their carpets, home movers tackling stains and reviving their home before a sale, landlords cleaning properties at the end of tenancies, and even just those homes which need a little TLC from doing a Spring clean! Call us today to book your carpet cleaning service in Southend or across Essex. How can I be sure a company is an NCCA member? Roffey carpet cleaning has been a member since 2009. Check the website listing or contact the NCCA office. All registered members are listed on the website. Do carpet-cleaning companies have to be registered with the NCCA? No, it is not mandatory for carpet cleaning companies to become members of the NCCA. However, if a company is registered with us it shows that they have taken the time and expense to ensure they are professional in their approach and in a position to offer the best possible service to their customers. In most cases NCCA members will be happy to move furniture; however there may be an additional charge for this service. It is important that any valuable items or furniture containing valuables are moved by the customer, you should draw this to the attention or the person cleaning. I have heard that my carpets re-soil quicker following cleaning, is this true? This is a common myth, today’s chemicals and detergents are manufactured to the highest specifications for quality and effectiveness. These will not lead to any rapid re-soiling. Detergents that are not designed for use on carpets and upholstery may cause re-soiling problems. Do NCCA members use chemicals to clean? In every case, the best cleaning results are achieved by the use of chemicals. NCCA members may use solvents, powders, detergents and other solutions during the cleaning process. Manufacturers in the cleaning industry work to the highest specifications for quality and safety, designing products specifically for the cleaning of carpets and soft furnishings; and for safe use within the domestic environment. I have children/pets; will they be affected by cleaning processes/chemicals? Health and safety is paramount in the cleaning industry. Professional cleaning solutions are tested for their effects on the environment. NCCA members will also ensure that the relevant safety procedures are followed during the cleaning process. It is highly recommended that children and pets stay off of a damp carpet until it is completely dry, this will help prevent slip and fall hazards. No guarantee can be made remove stains. Some stains permanently damage the carpet fibres and no amount of specialist cleaning will reverse this. Many NCCA members have received advanced training for spot and stain removal and will be able to deal with most problems. i pride myself in my stain removal abilities. If you have a stain you are concerned about, please feel free to discuss it with a member beforehand and they will be happy to advice. If a carpet is properly installed, it is very rare that the cleaning process will cause it to shrink. NCCA members are advised to carry out a full inspection prior to any cleaning. How long will my carpet or Sofa take to dry? Drying time depends upon many things, including how soiled the item was, how much water was used, weather conditions, atmosphere in the home, etc. However, in most normal cases, carpets and soft furnishings should be dry within 6-8 hours. If required, use some specialist techniques to speed up the process can be used. What are the differences between the methods of cleaning and which method is best? Many different methods exist and all cleaning methods are designed to produce good results, each has its place within the carpet cleaning industry. Some methods use water and others more mechanical action. More important however, is whether the employed technician has the required training to carry out the cleaning properly and safely. NCCA members have a recognised qualification in carpet and upholstery cleaning and have been trained to use various cleaning methods. They will be able to advice on the most appropriate method. That is required to achieve the very best results. Can I clean my soft furnishings myself? It is recommended that a professional cleaner is used. Many items are available to the public that are advertised for carpet and upholstery cleaning. However, along with these come many risks and the potential of causing irreversible damage. NCCA members have the correct training and knowledge, along with access to professional products that enable them to ensure that a correct and safe job is carried out and the best possible results can be achieved. Most manufacturers recommend that carpets should be professionally every 12-18 months. Carpets should be cleaned on a regular basis, before they become heavily soiled. Allowing soil to build up will significantly reduce the life of a carpet. Do you belong to any organisations? We are members of the NCCA – The National Carpet Cleaners Association. We are also members of TACCA – The Approved Carpet Cleaners Association – A trade association for UK carpet cleaners that has strict criteria for joining, including requirements for full insurance, the right equipment and advanced training. This ensures that by choosing a TACCA approved member, you will have the reassurance your carpet cleaner is equipped for the job. We are also members of checkatrade so you can read reviews of our service before buying from us. We use some of the best chemical solutions available to our industry. Most of our chemicals are chosen for their effectiveness whilst also keeping environmental concerns in mind when we choose. If you require eco friendly cleaning we can offer this service to you. Can you clean very old or badly stained carpets? You will be amazed at the impressive results of our carpet cleaning service, as we utilise the best equipment and extensive training to deliver the best cleaning service every time. Although we are highly trained in spot stain removal, there can be stains that are permanent, and we will do our best to identify these and warn you beforehand. But in general, most of our customers are impressed by the effectiveness of our cleaning service. How long will my carpets take to dry afterwards? This depends on lots of factors such as the pile density of the carpets being cleaned, the ambient temperature and air humidity, and air flow through the premises. Unlike many companies using underpowered equipment, our vacuum extraction machine has the suction to get your carpets almost dry after cleaning. We will recommend several ways to speed up the final drying stage, but with the heating on and some windows open, most of our customer’s carpets are usually dry within an hour of us leaving. If for any reason we anticipate the drying process to take slightly linger (in unheated or unventilated rooms) we will speed up the drying process with high powered fans and air movers. At Roffey Cleaning we have spent many thousands of pounds over the years on our equipment, and the device we normally use for carpet cleaning is our Hot Water Extraction (or steam cleaning) machine. This machine pumps highly pressurised water deep into the pile, completely rinsing out the cleaning solution that has been agitated into the carpet. This removes unwanted dust, debris and bacteria, providing relief for those of us who suffer from allergies and generally creating a cleaner, safer environment wherever Hot Water Extraction is used. Hot Water Extraction doesn’t just offer the best deep clean on the market, but it’s also environmentally friendly and very efficient. It won’t expose you to the chemicals that carpet cleaning techniques employed by other companies do, and it will have your carpets dry in rapid time, causing minimum disruption to your home or business. Of course this is equipment that is being used by highly trained and experienced professionals, so we can get the best results for you carpets. We can clean deeper into the carpet to leave them cleaner and fresher which can make a huge difference to your home. The most common problem you run into with cheaper, DIY-style devices is over-wetting. Rental machines rarely have the vacuum suction power to extract all the water that is absorbed by the carpet. This can lead to unpleasant odours caused by bacterial growth, and when that happens you’ll need to get a professional in as soon as possible to avoid having to shell out for an expensive replacement. At Roffey Cleaning we get the job done properly the first time, and we offer much better value for money than cheaper cleaning companies who use inferior equipment. Protect the investment you’ve made in your carpets and get in touch with our friendly team today to book a free, no-obligation quote!